I started incorporating centers into my elementary general music classes about 3 years ago and have loved using them. My favorite way to use them is as an incentive for classes to earn for their behavior- you can read more about how I use centers to give students something to look forward to, while also continuing their learning and incorporating a broad range of learning styles and interests, in this post. Today I wanted to share some of my favorite center activities to hopefully give you some fresh ideas to incorporate into your own classroom! Of course the iPad is always a fun and easy way to incorporate skill practice and composition in a way that students enjoy. My favorites include Rhythm Cat, Music Tutor, Monster Chorus, and The Young Person's Guide to the Orchestra. 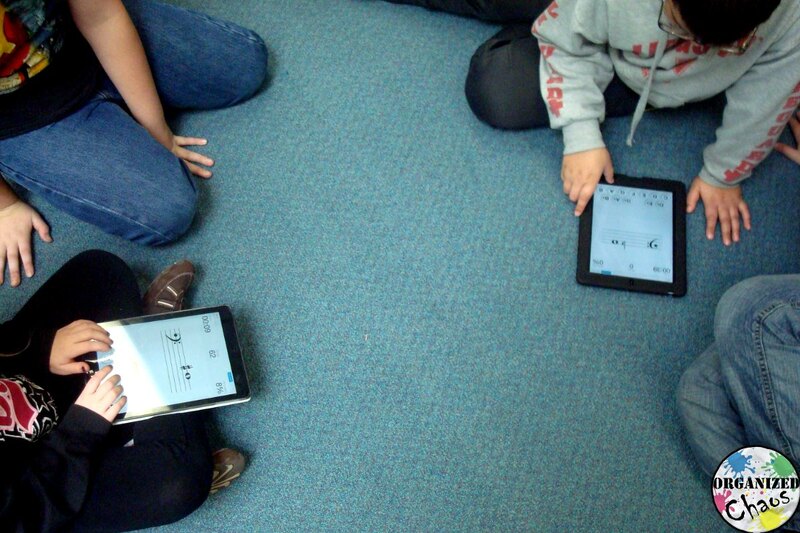 You can read more about tons of different awesome iPad apps for elementary music on the website Midnight Music. 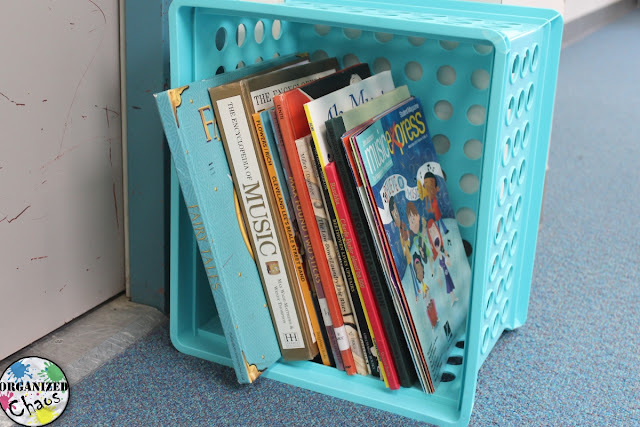 I keep a small milk crate full of reading material related to music. It includes everything from a music encyclopedia to Music Express magazines and storybooks related to music. This center is a favorite of my quieter students, but everyone seems to enjoy the change of pace! I keep some pillows nearby for students to use while they read as well, and it creates a nice, cozy space for students to relax. This one is simple: I give the students a melody to play with color-coded notes and they practice playing it together on the boomwhackers. There are a few different ways I give them the music depending on their age. For the youngest ones I just use circles or dashes with the matching colors. I have made my own with colored markers and have also used these from the Elementary Music Methods blog (I just have them look at it on the computer or project it on the screen for them). For older students I print out a song that is notated in standard notation and color the noteheads with markers. I've also used pre-made ones online on the computer for this. I use this game for rhythms, note names, and music vocabulary, and the kids LOVE it. Basically they draw a stick, answer the question, and if they get it right they keep the stick. You can read more about this game in my blog post here (which also has some other fun letter name center ideas). 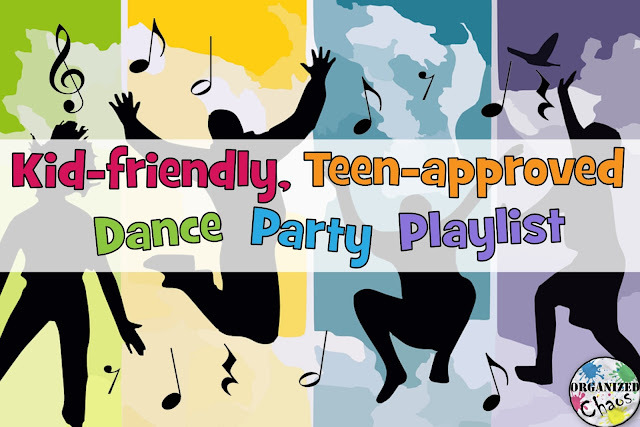 There are so many options here, and they are all fantastic fun for students! I've made my own cards for matching games (like find the staff note that matches the letter, or the picture that matches the instrument name), and found tons of great card and board game printables on TeachersPayTeachers as well. I'm also working on a few new centers using regular board games that I am modifying for music, like Twister and Jenga. You can read more about how to use traditional board games as music games in my blog post on things to make for the music room. The basic idea here is to have students use manipulatives, like little erasers or foam cutouts, to create rhythm patterns. 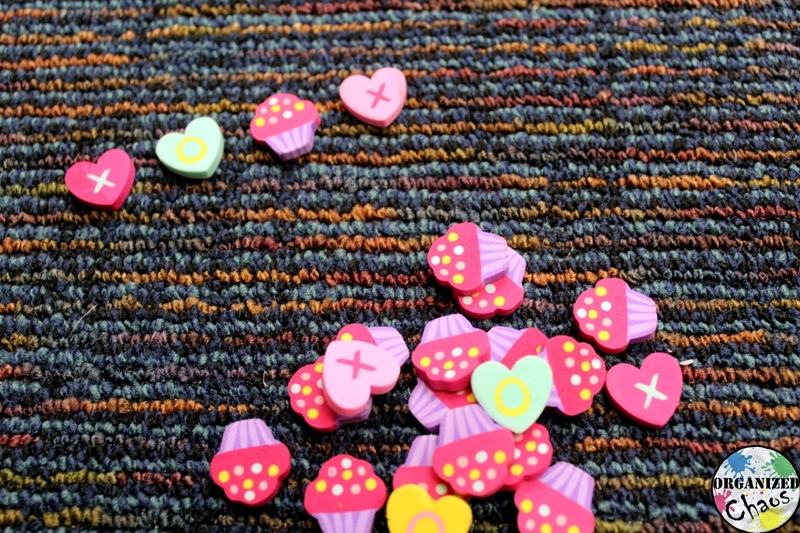 Find a collection of items that fit a particular season or holiday that have different numbers of syllables in their names (like the hearts and cupcakes in the picture above). Students line them up in whatever order they choose, then "rap" the words by saying each name on a steady beat. 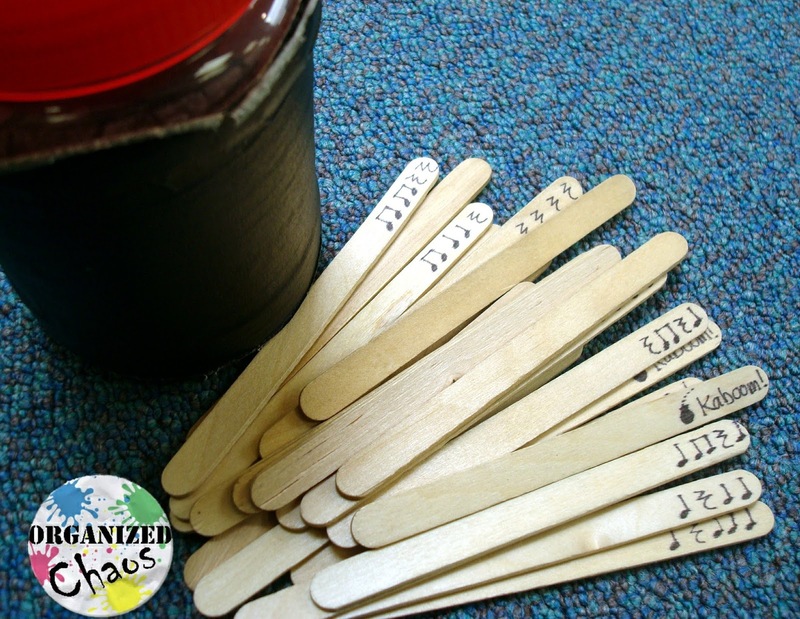 You can also have students then clap the rhythms of the names instead of saying them out loud! 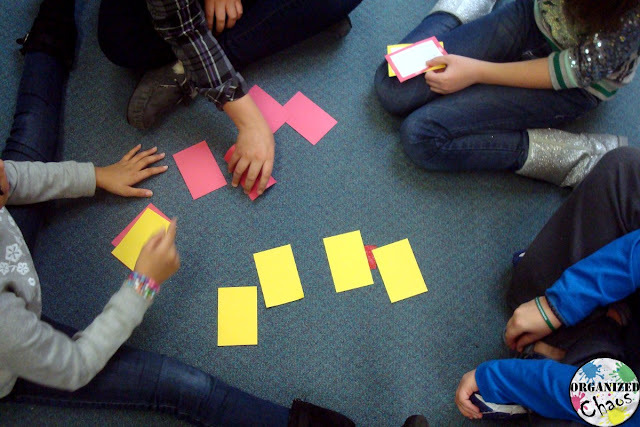 Read more about using manipulatives for composition (and where to find them) in this blog post. I have found this to be a great one for students to be able to practice writing music notation. 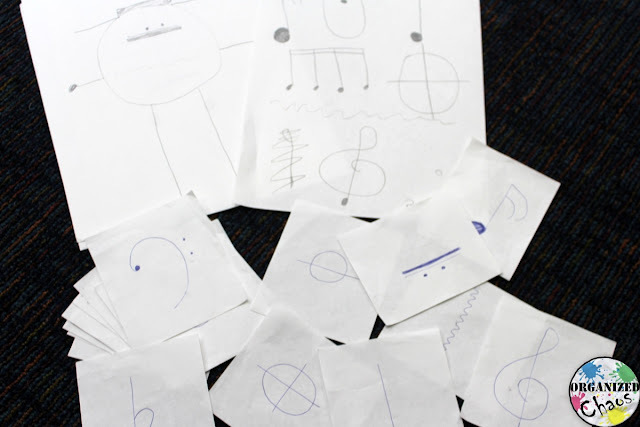 I wrote out several different music symbols, including different clefs, articulation and dynamic symbols, and music notes, on different cards, then I give the students a blank sheet of paper. They are allowed to copy any of the music symbols on their paper to create their own picture. Many of them make a face (by using the fermata symbol for the eyes and a crescendo for the nose, etc), or just doodle different symbols randomly on the page, but they all really enjoy this activity! There are, of course, many other center ideas that I like but these are some of my favorites. I hope you found some new ideas in this list! What are some of your favorite center activities? I'd love to hear about them in the comments below (and I'm sure other readers would benefit from your ideas too)! You can find more ideas for centers to practice rhythms here, and centers to practice note letter names here. Stay tuned for more new center ideas too- I'm working on some new ones that I'm excited to share once we've had a chance to test them out! 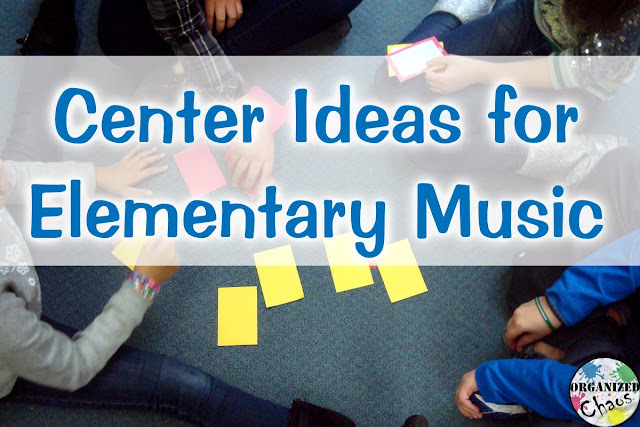 Thinking about using centers in your music classes for the first time? You might want to check out my post on organizing the logistics of centers for more ideas on how to manage the process and set things up to make things as smooth as possible for you and your students. Want more? Subscribe right here to the Organized Chaos newsletter and get ideas and resources for elementary music teachers sent straight to your inbox! My biggest challenge with center related lessons is when I have 7-10 blocks of classes with 0 minutes of transition (to change out grade level appropriate learning materials, games, etc) I do have a lunch in the "middle" after 5-7 class blocks but in reality it's more like 10 min. to 'shovel' it in. I'd love to use centers but changing out resources has always been the challenge I can't problem-solve. Any ideas? These are great suggestions. I too would often put out the materials while I was explaining each center. That way, I could also anticipate questions they might have and answer them before they get started. I love that you have a center with music books. I never thought of doing that. Great idea! How long do the kids stay at each station? My classes are 40 minutes.